Idris Jusoh (second from right) and Wan Mohd Zahid Wan Noordin (right) at the event. 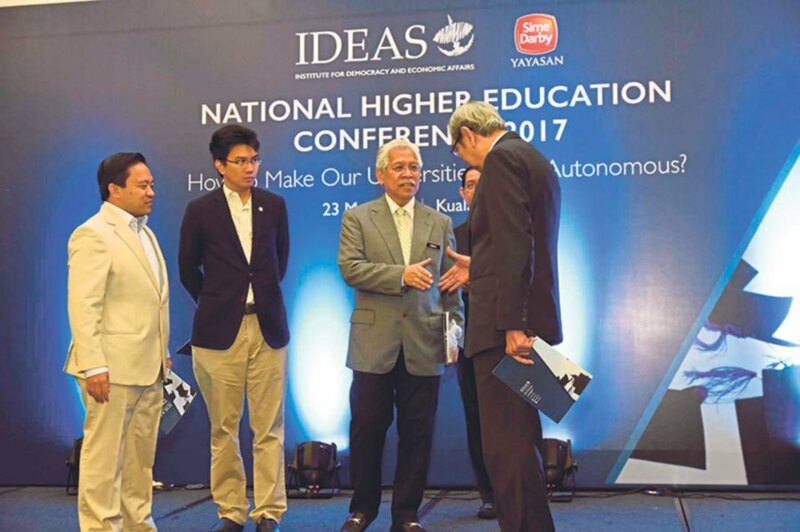 UNIVERSITIES should aim for autonomy and accountability which is crucial for the growth and development of the higher education sector in the country said Institute for Democracy and Economic Affairs (IDEAS) chair of higher education Professor Tan Sri Dzulkifli Abdul Razak recently. Speaking at the National Higher Education Conference 2017: How to Make Our Universities More Autonomous? last week, he added that universities are currently operating like a bureaucracy rather than centres run by intellectuals. “This conference serves as another milestone where issues related to university autonomy are being re-articulated after a period of intensive research and consultative discussions culminating in the historic meeting of minds. “This is a defining moment for higher education in Malaysia, especially in universities, to once again put forward the agenda of university autonomy on a national platform. I am very optimistic that we will arrive at another high point to elevate our universities as autonomous and accountable institutions,” he said. The National Higher Education Conference 2017 was held as a follow-up to IDEAS’ comparative study on Laporan Jawatankuasa Mengkaji, Menyemak dan Membuat Perakuan Tentang Perkembangan dan Hala Tuju Pendidikan Tinggi Malaysia — Langkah Langkah ke arah Kecemerlangan, better known as the Wan Zahid Report, which was published in 2005, and the Malaysia Education Blueprint Higher Education 2015-2025. The conference, held in collaboration between IDEAS and Yayasan Sime Darby, recommended the abolishment of the Universities and University College Act to be replaced by a National Higher Education Act. Also present at the conference were Higher Education Minister Datuk Seri Idris Jusoh and Yayasan Sime Darby governing council member Tan Sri Dr Wan Mohd Zahid Wan Noordin, who led the committee tasked with making recommendations to improve higher education in Malaysia in 2005. The Wan Zahid report made 138 recommendations to Parliament and includes proposals for academic freedom, financial autonomy and self-governance in universities, many of which were adopted by the Malaysia Education Blueprint Higher Education 2015-2025. Wan Zahid said: “I am pleased that the government took into account our call for autonomy in the Higher Education Blueprint. Through this project, nevertheless, we hope to strengthen current higher education policies in Malaysia to bolster our institutions further. Yayasan Sime Darby supported IDEAS’ research and advocacy initiatives based on the recommendation and findings from the comparative study. Throughout last year and earlier this year, IDEAS conducted four roundtable discussions with relevant stakeholders from the government, public and private universities as well as think tanks on the topic of autonomy and accountability of universities. Four policy papers were also produced on the different aspects of autonomy: the history and epistemology of universities, the history of autonomy, financial autonomy, and examples of university autonomy from around the world. -Institutional autonomy, particularly the transfer of administrative control to independent statutory bodies, the inclusion of academics to the university’s board of directors, the appointment of the vice chancellor by the board instead of the Ministry as well as the freedom for universities to hire and fire its own staff and decide on their salaries. ∙ Academic and student autonomy, including the university’s right to completely determine academic syllabi and university programmes as well as the admission of students, academic freedom for lecturers to teach content that they deem suitable for students as well as the elevation of the National Professor Council to that of an independent statutory body. Texts, lectures and courses: Where do we begin? BEGINNINGS: Intention and Method (1975) is Edward Said’s second book. His first, Joseph Conrad and the Fiction of Autobiography (1966), discussed the idea of becoming a writer — a project rather than a career. In the former, Said explored the beginnings of masterpieces of Modernism and works of theory. In this article, I am deriving benefit from Said’s Beginnings in configuring the significance of studying a course/subject at university. Every semester is a new beginning for a university student. And every course one registers for on campus to make up the required credit hours to graduate is the beginning of new knowledge. Here one has to go through the rigours of the course — attend lectures, take notes, write papers, embark on projects, sit exams and, of course, read the required texts. Engaging with the required readings precedes the other rituals. These are the beginnings, I suppose, when we take up a course offered by the university — within faculties, departments and programmes, and taught by a professor (used here in the generic sense). It is not simply a process, and never to be conceived as a bureaucratic arrangement in the routinisation of the schedule on a weekly and a semester cycle. It is fraught with new vocabularies — beginning and starting out, origins and originality, initiation, inauguration, point of departure, revolution, authority, etc — tacit to the student and most probably to the professor too, where the routine predominates. This process is similar to the beginnings of writing. Both refer to a kind of action, it frames the mind, a kind of work, an attitude, a consciousness. How will the course begin? — is there any epistemological trait that the professor wants to imbue the student with, what kind of orientation is there to begin with, and how will it end? Every first week of the semester (or it should be) is the presence of a beginning to the student. Central to this beginning is the text, a vocabulary lost (almost), being replaced by “Reference” (Rujukan) and just perhaps, a faint echo of “Required Readings”, over much of the last two decades. Thus in course outlines, “References” seem to be etched in stone. I have seen this in many universities in Malaysia, which I gather is the standard word. And so there will be a list of “References” —sometimes divided into primary and secondary, or just a single list of books, neither “primary” nor “secondary”, for particular courses offered. Over the years, I have often suggested to the universities/faculties/departments/programmes, in my capacity of assessor/reviewer of curricula, to substitute “References” with words such as ‘Readings” or “Texts”. I have written elsewhere on this, and at different times reminded us that words change the world. But “References” remain, as if decreed from heaven, dictated by the idea of authority. The regulatory authorities have determined the template for information on courses so much so that it is said to be unalterable. I sense our academics fear the authorities, either within the university or external to it, to make any form of alteration to the course outlines — substantive or otherwise. There is much obsession with what the regulatory body says and determines as “standards”. The sense of individual autonomy is lost in the academic career. Technologically, this is made worse by the structure of the system. Such a climate does not augur well for our universities. Back to the text. And so I have encountered that putting the word “text” resonates a condescending attitude, in the likes of what an academic has described as a “school textbook”. Does our academic body comprehend what is a text and what purpose it serves? A text serves as a beginning of something — in this case, knowledge and learning — some initial exposure to the corpus of a subject. A course title is not only one, but represents a substantive body of knowledge delivered with a certain rigour at a certain level, in this case, within a university setting. We have to return to the text. In Beginnings, Said illustrated that the concept of text carries with it an idea, if not an unequivocal achievement, of distinction, or of prestige. He was talking of the novel. And recently some academicians asked me if a work of fiction can be required reading, a text, if you will, for a social science course. I said “yes”. The idea of a text — required/compulsory reading for a course — is the preservation and presentation of a document — symbolising, producing and connoting meanings in addition to itself. Said, in the context of Beginnings, explained the text as associated to antiquity, say, to the Homeric poems to classical scholarship — its problems and preservation. In the West the classics and the Bible are the best preserved, the most worked over, the most transmitted, and hence considered “the most original texts of all”. Many institutions, including the university, are devoted to preserving the texts and prolonging them. In the Islamic tradition, textual traditions occur in different conditions. One of them is the idjaz, a concept describing the uniqueness of the Quran as rendering all other text impotent by comparison. All texts are secondary (to the Quran). There is a hierarchy of disciplines and of books in relation to the Quran. The sciences of jurisprudence (fiqh) and tradition (hadith), and sets of systematic textual custom control the editor’s work. There is a canon of valid sources. There is also the system of idjaza (licence to transmit) — or ijazah (degree) in Bahasa Melayu. In the “manuscript age” — the period from the seventh up to around the end of the 15th century — every Arabic text generally opens with a list of isnads (asaneed) or witnesses, linking the text to a univocal source through a series of oral transmitters. We may have to reflect that a text fundamentally is that which is read, the production of which is an event, physically, intellectually and spiritually, which has its own genealogy which cannot begin with its reading. A text is a continuing desire to preserve a corpus, in which we have selected as a reading material for our courses. And there is the primary text/s, and the secondary text/s (or primary reading/s and supplementary reading/s). I am afraid, we have lost this, or have we? We need technology but at what cost? THE recent WannaCry ransomware attack left the world in a frantic mode. The worldwide massive cyberattack on computers running Microsoft Windows operating system reportedly struck more than 200,000 computers in 150 countries. Russia and the United Kingdom were said to be among the worst-hit. Cybersecurity firm experts are warning that it can only get worse before it gets better because society has become more reliant on technology than ever before. Ransomware is a malicious software that locks up victims’ data in electronic gadgets such as computers, tablets or smartphones and threatens to expose the data or delete it until a ransom is paid. It is basically a denial-of-access cyberattack that prevents us from accessing our data. While there are many forms of ransomware out there, WannaCry is perhaps the most dangerous yet. System analysts traced the root of the ransomware to a Microsoft security patch released in March, so those who had updated their systems with the patch were more likely to be victims of WannaCry. However, it doesn’t stop there because many are still at risk and it’s only a matter of time for WannaCry to spread through the email chain. Today, it seems that the world is no longer safe anywhere. Real world or virtual, we are just as vulnerable when it comes to safety. Technology has opened up an infinitude Catch-22 situation that we are unable to resolve. We need technology and we definitely cannot live without it but at what cost? We are indeed held ransom by technology as we continue to become more dependent on it. With the Internet of Things (IoT), the reliance on technology can only increase in the future. We live and breathe technology every second of the day. Even when we sleep, technology in IoT dominates our time. IoT, the next stage of evolution in consumer products, is connectedness. It affects every item, from the toothbrush to the fridge, and the television to the camera that uses wireless protocols to connect. Though we now think we are protected by fingerprint readers, these are also prone to cyberattacks. If you think your fingerprint is unique, think again. Masterprints, digitally altered fingerprints that work like a master key, have been discovered by researchers for New York University’s Tandon School of Engineering. With these masterprints, one can unlock up to 40 per cent of smartphones. Ransomware is not the only nasty bug on the list. We have experienced trojans, malwares, worms and more in various stages over the years, all created by hackers. As technology evolves, so do these bugs. While we think that these mostly target governments and corporations, think again because any one of us is just as susceptible to hackers. Depending on the intentions of hackers, some may not even want anything in return… just the satisfaction of creating disruption or chaos in people’s lives. If you are infected by ransomware or malware, the first thing you should do is disconnect your computer from the Internet so it does not infect others. Most of these attacks rely on your connection to spread, so disconnect to end it before it goes viral. Report the crime to law enforcement or cybersecurity experts. Even if you pay the hackers, there’s no guarantee they will unlock or restore your access to your data. Kota Kinabalu: Chief Justice of Sabah and Sarawak, Tan Sri Richard Malanjum, has expressed hope that the Native Court system will be out of the hands of state executives. He stressed that it is important for the institution to be independent, particularly when it concerns the appointment of community leaders. “I’d like to see the day will come,” he said in his keynote address at the Majlis Jaksa-Jaksa Pendamai (Majaps) and Sabah Law Association (SLA) seminar themed “Justice and Rights – The Way Forward”, here, Monday. He said as an independent body, no state executives or politicians can meddle in its affairs. “YBs (Yang Berhormat) should not be involved in who should become a (native) chief (and) Ministers should not be involved in who should be a district chief. This is important,” he said. He lamented, however, that this has not been the practice in some cases, causing blurred lines between the service to the “adat” and political interest. “With all due respect, some of the native chiefs are more politicians than (being) native chiefs. And if you’re not on the same line with them politically, you’re dead meat. That’s not fair. So I think we need to change this,” he said. On this note, Malajum reiterated his call for the Native Court in Sabah and Sarawak to be elevated on par with the civil and Syariah courts. “If you look at the constitution, what we have now is the civil and Syariah court system of justice in Malaysia. There should be a third system, which is the indigenous court system, which has the same standing as the civil and Syariah laws. We want the system to be in the Constitution to cater far native laws. At the moment, the Native Court is controlled by the executives,” he said. Malanjum has been a strong proponent of the third system, having on various occasions spoken up on the need to set it by virtue of the three to four million indigenous population in both East Malaysian states who are still practising their “adat” and customs. He was once reported as saying that the Native Court was still relevant today to ensure as custodians, the survival of the customary laws handed down from generations. The recognition of the Native Court as the third justice system, he said, will effectively release it from the control of the executive and politicians alike. “With the third system, we will have a commission to appoint native chiefs. It will be independent and respected. That’s how it should be,” he said. He noted that the third system was the grand plan of long serving former Attorney General of Malaysia, Tan Sri Ghani Patail, and effort towards making it a reality had reached 80 per cent. He urged Ghani and State Attorney General Datuk Mariati Robert to continue picking up the matter while making the same call on Majaps and the SLA to help pushing it. Speaking in jest, Malanjum said the Government might make a pledge to make it happen in view of the general election mood. He noted that Malaysia can learn from Papua New Guinea that has successfully established its third system in the judiciary. Meanwhile, Ghani, when met, said there is actually already a third system as the Native Court is recognised by the Constitution. “It’s already there. It’s just that you don’t have the proper system and structure yet. The Native Court needs to formalise this first. It has to fortify the system and that’s what we were doing as what Tan Sri Richard has said about the 80 per cent. I think they’re still doing it,” he said. PUTRAJAYA, May 31 (Bernama) — Single-stream schools to forge unity, work-family life balance and improved public transportation system were among the aspirations and suggestions voiced by civil servants at a National Transformation 2050 (TN50) dialogue session with the prime minister, here, today. When summarising these aspirations and suggestions which were described as stimulating by Datuk Seri Najib Tun Razak, the prime minister said he envisaged the formation of national schools that could build unity at an early stage. He said that among the characteristics of such schools were making Bahasa Melayu as the medium of instruction, boosting English language proficiency, making Tamil, Mandarin and Arabic as strong electives, providing quality education and the composition of teachers and students from various races. Najib said he did not make those suggestions but envisaged the characteristics of schools from which multiracial unity could begin. However, he added, this was a very sensitive matter, a political landmine, as Malaysia had different school streams. “Can we accept this (unity) school model? We all need to think about it. I am not suggesting it, just envisaging, as a lot of people say they want unity and that it should start from school. We want solutions. This, we need to think about as everything starts from school. “It’s not that we want to decide now, but I am just visualising. What’s the solution? It’s not that we want to close down Chinese and Tamil schools but to choose the (appropriate) kind of national schools,” he said. At the dialogue session involving about 1,300 young civil servants, among the aspirations expressed was the emphasis on unity through education by building single-stream schools with Bahasa Melayu as the lingua franca and empowering the English Language subject without sidelining Tamil and Mandarin. Also raised was the matter of work-home life balance by setting the maximum hours that would not tie down civil servants to long working hours to the point of them sacrificing their time for their families. On healthcare affordability raised at the dialogue, Najib said the fee of RM1 for treatment at a government health facility was not sustainable as the government spent RM21 billion to RM22 billion per year on the health industry but only collected RM400 million to RM500 million although Malaysia’s healthcare service was the best in the world. He cited the case of patient Razali Tompang who had to pay only RM31.80 for his father’s cancer treatment at Kuala Lumpur Hospital when the actual amount was RM11,000. “Where in the world can one be charged so low (for cancer treatment)?” Najib said. On the issue of public transportation, one of the civil servants said he wanted to see Malaysia not bogged down anymore by the problem of traffic congestion by 2050. KOTA KINABALU: With many people observing the holy month of Ramadan, it is a modest celebration at this year’s Kaamatan or Harvest Festival in the state. 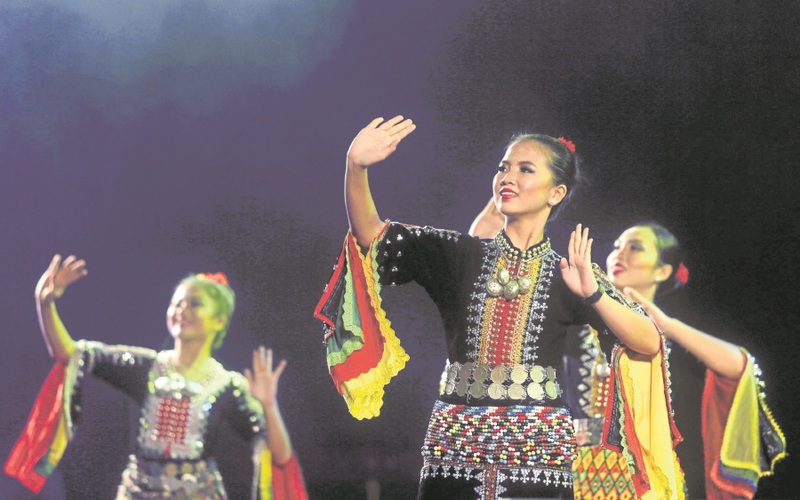 However, it is no less merry with activities such as traditional sports, performances and exhibitions taking place at the Kadazandusun Cul­tural Association centre in Penam­pang despite the unpredictable weather. Launching the traditional sports, Chief Minister Datuk Seri Musa Aman said Kaamatan – one of the most important celebrations for Sabahans – should be observed meaningfully. He said that the array of programmes lined up as well as the traditional costumes showed how rich and diverse the cultures in Sabah were. “We should continue promoting and ensuring the continuity of our unique cultures, food and handicraft,” he said here yesterday. Such efforts, he said, were important in ensuring that Sabah’s rich cultural diversity continued to grow and not be forgotten. “Kaamatan is also a festival where we can learn more about each other’s ethnicity, beliefs and practices,” he said. His speech was read out by Huguan Siou or Kadazandusun paramount chief Tan Sri Joseph Pairin Kitingan, who is also the Sabah Deputy Chief Minister. The month-long Kaamatan festival reaches its climax today, which, among others, will see the crowning of the Unduk Ngadau (Harvest Queen). Yesterday, the 44 beauties vying for the title introduced themselves. Vision Primary School Sandakan which has been in operation since January this year, now has 51 students in Primary 1 and Primary 2. Its head teacher, Desmond Chong talks to our Sandakan Bureau Chief James Leong about the school. The Anglican Churches in Sabah have been running Mission Schools for more than 120 years, and the Vision Schools are the latest instalment of our dedication to this cause. The Vision Schools Project is a continuation of the Anglican Diocese of Sabah’s commitment to education in Sabah. The Anglican Church has been faithfully involved in providing quality education to Sabahans since the 1800’s, and many of our mission schools are still the schools of choice. Our classrooms at the Vision Primary School Sandakan are equipped to bring our students into the 21st Century Learning. The books that we use are also sourced from among the best we could find to promote creativity and critical thinking among our students. Lessons are designed for students to learn together in collaboration and they are trained to give their opinions since young. We aim to produce forward thinking intellectuals that have a good character and that they may become major contributors to society at large. As the Vision Primary School is now fully functional and running, we begin to look forward to the building of the Vision Secondary School (15 classrooms) which we expect to run in 2021, the latest. By then, the entire 1st Stage of the project will be completed, and we expect this to be sufficient for the next 15-20 years. All you need to know about Vision Primary School Sandakan: FAQ(Frequently Asked Questions) 1. When did the school start? We began operations on the 3rd January 2017, starting with 2 classes of Primary 1 and 1 class of Primary 2. 2. Is it an International School? We are a local private school, running on the Malaysian Education Syllabus. 3. What syllabus do you use? We are licensed to run DLP (Dual-Language Programme) as provided for by the Ministry of Education, whereby our students may answer their UPSR Maths and Science papers in English. We use books from Singapore to supplement our local syllabus requirements for English, Maths and Science. 4. Is it recognised by the Malaysian Ministry of Education? Yes, we are a fully functional school, registered with the Ministry of Education. In fact, our sister school in Bandar Sri Indah, Tawau has been operating since 2009. 5. Can the students get into local universities? Yes, our graduates from Tawau have been admitted into local and private universities, Kolej Matrikulasi Labuan, progressing to University Malaysia Sabah, and also STPM in local schools. 6. Where do you get your teachers? Are they trained? Our teachers are hired locally by the School Board. Training and professional upgrading is provided periodically by our education consultants from KK and the USA. Our teachers will also gather with the teachers from Tawau for corporate training annually. 7. How do I enrol my child? We have started taking Primary 1 in applications for 2018 and 2019. You will need to come to the school and fill in an application form. MACHANG, May 25 (Bernama) — The Rural and Regional Development Ministry (KKLW) is targeting 80 per cent of students of kindergartens under Community Development Department (Kemas) to master three new syllabus implemented this year. Deputy Minister Datuk Ahmad Jazlan Yaakob said the three new syllabus, namely Islamic Education Appreciation, Patriotism and Self-confidence, should make Kemas kindergartens more advanced and comparable to other private early-education institutions in the country. “The government wants Kemas kindergartens to be the main choice for parents to send their children to, and to change the perspective tagged on Kemas kindergarten being the second and third choice,” he told reporters after opening the national level of ‘Kemas Berselawat’ programme at the Sultan Yahya Petra Mosque here today. More than 1,000 pupils from the Machang parliamentary constituency participated in the programme that was also attended by Kemas director-general Datuk Amiruddin Ariffin. MELAKA (Bernama) — In 2016, the passing rate for the English paper in Sijil Pelajaran Malaysia (SPM) was at 79.4 percent. This achievement motivated the Education Ministry to push the bar even higher, setting the passing rate at 81 percent by 2020. However, the reality is that achieving the target would require a lot of effort by all parties concerned. This would include introducing new language teaching and learning methods and a revamped English syllabus for schools. I find that the most important measure to take to realise such ambition is to have more English teachers like those of yesteryears. This is in addition to parents providing wholehearted support for children in learning the language. When I think of the quality of English teachers back then, my mind goes to the late Lee Siew San. She taught Malaysia’s distinguished cartoonist Datuk Mohd Nor Khalid, better known as Lat, and inspired him to create the iconic character of Mrs Hew in his Kampung Boy series. Lat recognised that beneath Lee’s stern exterior, she had a heart of gold. She relentlessly taught Lat and his friends in the village how to read, write and speak in English, eventually helping them go far in life. Just imagine if all of us had a ‘Mrs Hew’ of our own during our schooling years; that one teacher who worked relentlessly to get English into our hearts, to help us master at the very least the basic command of the language. These teachers usually employ old-school methods in teaching English, stern and often with a cane in their hands. However, their austere manner often belied a heart so gracious that no matter what you throw at them, they will always be there for you to not only help you master English but make you a better person. I came to know of my own ‘Mrs Hew’ back in 1991 when I started Form One. My English teacher then was Mr Choy Kim Chai who also happened to be the Kemahiran Hidup teacher. Since young I had been exposed to English by my father who spoke the language fluently. He used to buy us English books and comics, one of which was Lat’s Kampung Boy. However, Mersing, the place where I grew up, was just a small fishing town. The Malays there hardly spoke English. With only a few friends who could converse in English, I did not have much opportunity to improve my command of the language. Mr Choy himself pointed out that to improve my proficiency in the language, I had to practice by speaking and writing. However, the circumstances made it difficult for me to do so. My eagerness to learn English caused me to be mocked, shunned at and laughed at by my friends back then who thought I wanted to be a Mat Salleh (Englishman). Mr Choy, however, kept encouraging me to speak the language and told me to ignore what others said. I have fond memories of Mr Choy. He was the one who encouraged me to take part in English competitions, from spelling bees to essay-writing, most of which I did miserably due to my terrible grammar. However, Mr Choy kept telling me to push ahead and not give up on improving my English. He once joked that if I wanted to gain more knowledge, I should learn English, but if I wanted to woo the girls, I should learn French instead. I have admittedly been caned by Mr Choy in the quest to improve my proficiency of the language, but it was not something that I remember in bitterness. I owe a lot to Mr Choy for the level of English that I can communicate with today. My improved command of the language has given me an edge in many areas. While I was in university, where reference books tended to be in English, my ability to understand the language was a great advantage. Now, as a journalist, it enabled me to conduct interviews in the language with great confidence. Mrs Hew and Mr Choy are just two examples of how English teachers can change our lives by inspiring us to master the language. However, nowadays, how many parents lambast teachers over their children’s poor command of English? I believe there are still many teachers like Mrs Hew and Mr Choy. Today, my 12-year old daughter has a decent command of English, thanks to her English teachers. The same teachers also instilled in her passion in writing. I, too, have been encouraging her to speak and write in the language and am happy to note that she has taken to writing as I did. You are currently browsing the www.Teo-Education.Com blog archives for May, 2017.